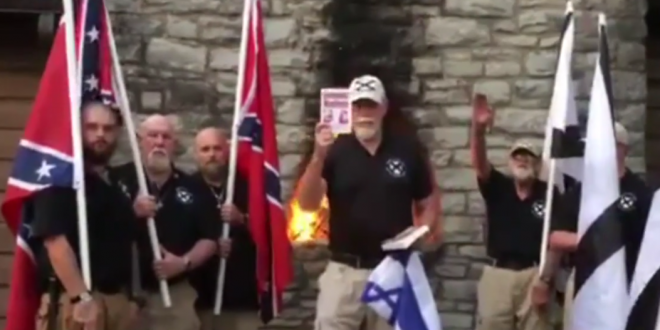 Christian Hate Group Burns Israeli Flag, Throws Hitler Salutes, Calls For End To "The Holocaust Hoax" [VIDEO] - Joe.My.God. “We are here tonight as the League of the South to put three items to the flame, into the ovens of justice. One is this insidious star of Remphan, the symbol of the Jew. The second is ‘The Communist Manifesto,’ written by Jew Karl Marx, which was responsible for the deaths of over 100 million people in the 20th century. And the Talmud, the blueprint for international Jewry’s plan to rid the world of the white race. “All of these will be consigned to the flames of justice tonight. 109 times in the history of the world, the Jew has been banished from our midst. Lord, we ask that you make number 110, come soon, for our Southland. “And we also, father, ask you to reveal to the world that hoax that the Jew has been perpetrating now for many years—something called the Holocaust, which is nothing but a con game based on all three of these symbols. We stand for the white race against all of our enemies, particularly the Jew, and all of these symbols represent that enemy.” – League of the South president Michael Hill. PREVIOUSLY ON JMG: Michael Hill participates in JMG thread. The League Of The South celebrates the 150th anniversary of Abraham Lincoln’s assassination. The League defends the white supremacist who inspired Charleston terrorist Dylann Roof. The League provides protest signs at rally to support Roy Moore. Creationist Ken Ham headlines convention held by former League head Michael Peroutka. Right Wing Watch reports that Michael Peroutka bankrolled the return of Roy Moore to the Alabama Supreme Court. The SPLC reports that the membership rolls of the League and the Council of Conservative Citizens “overlap greatly.” Tony Perkins speaks at 2001 meeting of the Council Of Conservative Citizens.